Welcome to Acorn Content Creation, where nothing but the best is good enough. This Hourlie is for 1000 words of first-class, keyword-rich content. Since our content is written by native English UK graduates and postgraduates, every order we work on is finished to the highest quality. We can also post directly to your WordPress blog, source free-use images, build links and more! 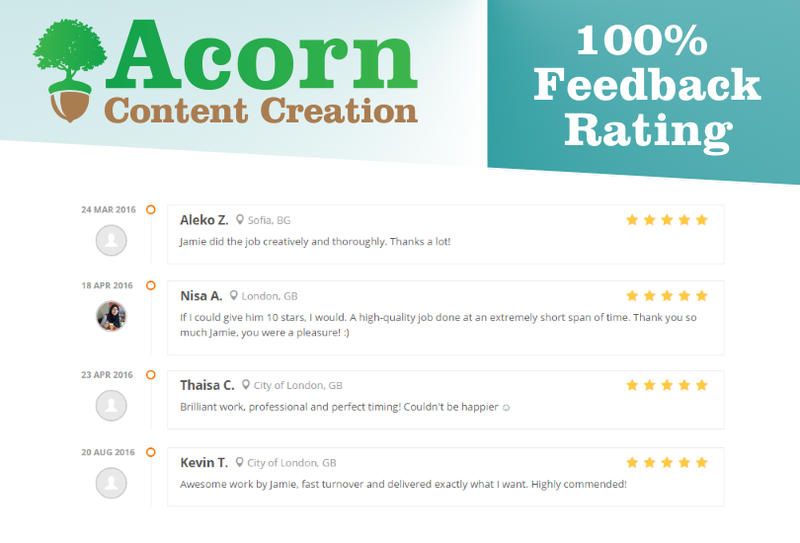 Acorn Content Creation is a Manchester-based content marketing agency dedicated to helping your business grow. 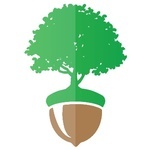 Whether your business is a tiny sapling or a mighty oak, we can help you identify, capture and engage your target audience with content of the highest quality. Every piece of content we deliver is entirely original, keyword-rich, and guaranteed to help your business do what it does best- whatever that might be. - All our content is written by UK graduates and postgraduates. - We’re trusted by hundreds of clients on PeoplePerHour, Fiverr, Upwork and more. - We're in the Top Cert/top 2% of sellers on PeoplePerHour, and our customers have collectively given us a 100% Feedback Rating. - We work for bloggers, ‘solopreneurs’, startups, affiliate marketers and businesses small and large. HOW DO WE DELIVER QUALITY? 1) Every ounce of our content is researched and written by UK graduates and postgraduates. Unlike many of our competitors, all of our writers are native English speakers. 2) We offer stellar customer service, and treat every client as if they were our only client. 3) We offer a no-questions-asked revision and refund policy. Nothing but the best is good enough. If you have any questions with regards to this Hourlie, or anything else, please don’t hesitate to get in touch. All you have to do is let us know the topic of the content, what it's for and any special requests you may have. You can leave the rest to us. Great work. Acorn Content always delivers quality content on-time. Excellent work. Acorn Content is the best SEO writer in the history of SEO writing. 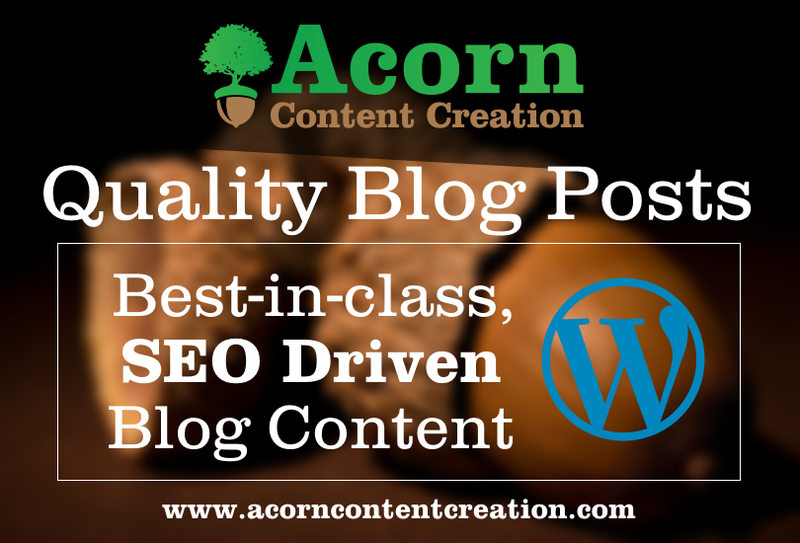 Acorn Content always delivers quality work, content and communication. Acorn is my preferred content experts! Smart, affordable content marketing for small businesses by Acorn Content Creation. Acorn Content Creation is a Manchester-based content marketing agency dedicated to helping your business grow. Since our content is written by native English UK graduates and postgraduates,...Read moreAcorn Content Creation is a Manchester-based content marketing agency dedicated to helping your business grow. Since our content is written by native English UK graduates and postgraduates, every order we work on is finished to the highest quality. We can also post directly to your WordPress blog, source free-use images, build links and more! If you have any questions with regards to our service, or anything else, please don’t hesitate to get in touch.